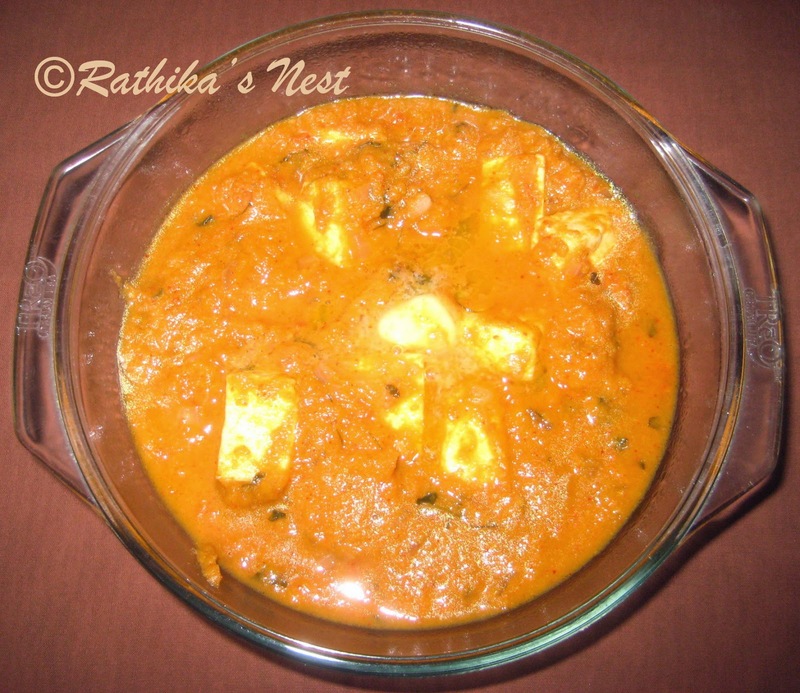 Paneer butter masala is a famous paneer recipe. I learnt this recipe from a neighbor a decade ago, who in turn learnt it from a Mumbai friend!!! It is always a wonder how recipes get circulated among ladies. Paneer butter masala, shortly called as ‘PBM’ is a hot favorite in my home and my son likes it a lot. This 'PBM recipe' works very well for me. Give it a try. You won’t regret it. *I prefer to chop one onion and grind the rest. This makes the gravy little coarse in consistency. However, you may grind all the five onions instead. *Add only the specified quantity of fenugreek powder, lest the gravy will taste bitter. Paneer Butter Masala (பனீர் வெண்ணை மசாலா), with melting butter in the center! Method: Peel and cut 4 onions into large cubes. Finely chop one onion. Boil tomatoes in hot water, remove the skin and blend in a liquidizer. Cut paneer into 1” sized cubes. Keep aside. Heat 1 tablespoon of oil in a kadai, fry onion cubes till they turn transparent. Transfer to a bowl. Once cool, grind onions, ginger and garlic into a fine paste. Heat the remaining oil in the kadai, add the chopped onions and sauté till they become transparent. Add the ground paste and cook on low flame for 2 minutes. Now add the tomato puree, coriander powder, cumin powder, kashmiri chilli powder, salt and sugar. Mix well and cook on low flame till the oil separates. Add paneer cubes and fenugreek powder and mix well. Then add kasuri methi and simmer for 2 minutes. Switch off the stove. Top the gravy with fresh cream and butter. Allow the butter to melt in the heat. Mix well just before serving. Paneer butter masala goes well with all kinds of rotis and chappatis. It can also be served with pulav. Note: You may add 1 large hollow ladleful (75ml measure) of boiled green peas to the preparation, if desired.